Microsoft released a beta tool called “Microsoft Web Platform Installer” this week that lets you install popular open source applications like Drupal and WordPress among others. I think this is a companion tool for Microsoft Web Platform Installer Beta released on Sep 30th 2008. 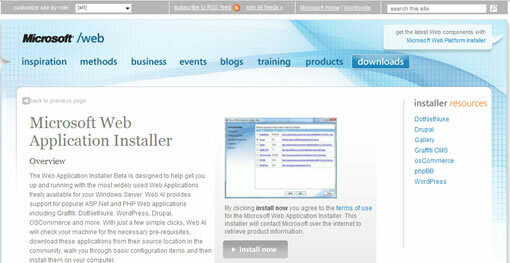 Microsoft Web Platform Installer Beta is a free tool that installs .NET Framework 3.5 SP1, IIS7.0 and Extensions, IIS FastCGI, Visual Web Developer 2008, SQL Server 2008 Express, SQL Server Management Studio, ASP.NET MVC and Silverlight Tools. It helps developers to quickly start building web applications in ASP.NET, Silverlight. The Web Platform Installer Beta (Web PI) provides a single, free package for installing and configuring Microsoft’s entire Web Platform, including IIS7, Visual Web Developer 2008 Express Edition, SQL Server 2008 Express Edition and the .NET Framework. Using the Web Platform Installerâ€™s simple user interface, you can select specific components or install the entire Microsoft Web Platform onto your computer. To help you stay up-to-date with product releases, the Web Platform Installer always contains the most current versions and new additions to the Microsoft Web Platform. Microsoft web application installer allows you to install popular open source applications, makes it simple to download and install DotNetNuke, Drupal, Gallery, Graffiti CMS, oSCommerce, phpBB and WordPress. Web installer will expand to include other open source applications in the future according to Microsoft. The Web Application Installer Beta is designed to help get you up and running with the most widely used Web Applications freely available for your Windows Server. Web AI provides support for popular ASP.Net and PHP Web applications including Graffiti, DotNetNuke, WordPress, Drupal, OSCommerce and more. With just a few simple clicks, Web AI will check your machine for the necessary pre-requisites, download these applications from their source location in the community, walk you through basic configuration items and then install them on your computer. The installer doesn’t come preloaded with code, it just simply downloads the code from the repositories when a user selects an application to install. Another thing to note is that PHP is not included at this time, but FastCGI module is included to get started with hosting and running PHP based applications. PHP will be included in the future releases of web platform installer. One reason for this open source code push could be to woo developers to popularize the Windows web platform. Drupal, phpBB and WordPress are well supported in LAMP platform and there is a ton of documentation available on the net to troubleshoot, but for Windows platform the documentation is not that great and i doubt users want to go with windows platform any time soon for hosting these applications. If they push the code this way developers and users will test the applications and get to know about the platform so that they can try the platform or can recommend to others. What do you think?. Hmm…Microsoft continues to surprise us with their willingness to finally reach out the open source community.